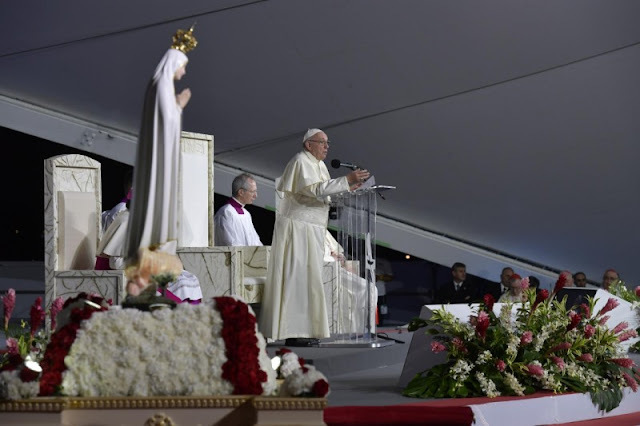 Pope Francis speaks to 600,000 young people at Panama City’s Metro Park for the WYD Vigil and invites them to imitate the Blessed Virgin Mary, “influencer” of God. We have watched that beautiful presentation about the Tree of Life. It shows us how the life that Jesus gives us is a love story, a life history that wants to blend with ours and sink roots in the soil of our own lives. That life is not salvation up “in the cloud” and waiting to be downloaded, a new “app” to be discovered, or a technique of mental self-improvement. Still, less is it a “tutorial” for finding out the latest news. The salvation the Lord offers us is an invitation to be part of a love story interwoven with our personal stories; it is alive and wants to be born in our midst so that we can bear fruit just as we are, wherever we are and with everyone all around us. The Lord comes there to sow and to be sown. He is the first to say “yes” to our lives and our history, and he wants us to say “yes” along with him. We are always struck by the strength of that young woman’s “yes”, the words “be it done” that she spoke to the angel. This was not merely passive or resigned acceptance or a faint “yes” as if to say, “Well, let’s give it a try, and see what happens”. It was something else, something different. It was the “yes” of someone prepared to be committed and take a risk, ready to stake everything she had, with no more security than the certainty of knowing that she was the bearer of a promise. Hers would undoubtedly be a difficult mission, but the challenges that lay ahead were no reason to say “no”. Things would get complicated, of course, but not in the same way as happens when cowardice paralyzes us because things are not clear or sure in advance. The “yes” and the desire to serve were stronger than any doubts and difficulties. Thank you, Alfredo, for your testimony and your courage in sharing it with us all. I was impressed when you told us: “I started working on a construction project, but once it was finished, I was without a job and things changed fast: without an education, a trade, and a job”. Let me summarize this in four “withouts” that leave our life rootless and parched: without work, without education, without community, without family. It is impossible for us to grow unless we have strong roots to support us and to keep us firmly grounded. It is easy to drift off, when nothing holds us down. There is a question that we older people have to ask ourselves, but also a question that you need to ask us and we have to answer: What roots are we providing for you, what foundations for you to grow as persons? It is easy enough to criticize and complain about young people if we are depriving them of the jobs, education and community opportunities they need to take root and to dream of a future. Without education, it is difficult to dream of a future; without work, it is very difficult to dream of a future; without a family and community, it is almost impossible to dream of a future. Because dreaming of a future means learning how to answer not only the question what I am living for but also who I am living for, who makes it worthwhile for me to live my life. As Alfredo told us, when we find ourselves at a loss and without work, without education, without community, and without family, at the end of the day we feel empty and we end up filling that emptiness with anything we can. Because we no longer know for whom to live, to fight and to love. I remember once talking with some young people, and one of them asked me: “Father, why are so many young people today not interested in whether God exists or find it difficult to believe in him, and they seem so bored and aimless in life? I asked them in return what they thought. I remember one particular answer that touched me and it relates to the experience Alfredo shared – “it’s because many of them feel that, little by little, they stopped existing for others; often they feel invisible”. This is the culture of abandonment and lack of concern for others. Not everyone, but many people feel that they have little or nothing to contribute because there is no one around to ask them to get involved. How can they think that God exists, if others have long since stopped thinking that they exist? The saints understood this very well. I think, for example, of Saint John Bosco. He did not go off to seek young people in far-off places but learned to see with God’s eyes everything that was going on in his city. So, he was struck by the hundreds of children and young people left to themselves, without education, without work and without the helping hand of a community. Many other people were living in the same city, and many criticized those young people, but they were unable to see them with God’s eyes. Don Bosco did, and found the energy to take the first step: to embrace life as it presented itself. From there, he was not afraid to take the second step: to create a community, a family with them, where through work and study they could feel loved. He gave them roots from which they could reach up to heaven. It is always possible to “sprout shoots and grow” when there is a community, a warm home that enables us to take root, that provides the confidence we need and prepares our hearts to discover a new horizon: the horizon of a beloved son or daughter who is sought, found and entrusted with a mission. Through real faces, the Lord makes himself present. To say “yes” to this love story is to say “yes” to becoming a means of building in our neighborhoods those ecclesial communities capable of walking the streets of our cities, embracing and weaving new relationships. To be an “influencer” in the twenty-first century is to be guardians of roots, guardians of all that prevents our life from dissipating and evaporating into nothingness. Be guardians of everything that can make us feel part of one another, to feel that we belong. In a few moments, we will encounter the living Jesus in Eucharistic adoration. You can be sure that he has many things to say to you, about different situations in your lives, families, and countries. Face to face with him, don’t be afraid to open your heart to him and to ask him to renew the fire of his love so that you can embrace life with all its frailty and flaws, but also with its grandeur and beauty. May he help you to discover the beauty of being alive.